The Wave is now in its 20th year of year of existence and is based out of Long Island, New York. The band has not only played together but they have also bonded as friends. They have played a variety of functions from summer picnics to Gala Banquets, from Pennsylvania through Massachusetts. Let us play your next affair! A highlight for the Band was when The Wave had their first television appearance on Cable Electric TV boradcasting. The entire performance was aired live from Bethlehem Musikfest with a very enthusiastic crowd dancing throughout the show! The Wave Band plays the very best in traditional and modern Ukrainian and American music. All of our music is performed live on stage. The band started about 20 years ago as a "jam" band and well -- just jelled. We've married off a lot of people, played a lot of parties and Zabavas (dances). Our mission is to make sure that everyone has as much fun as we do. Whether it is by listening to our latest recording or by experiencing a "live" performance. And there is nothing like feeling the energy from live musicians. Our business is making sure you have fun. 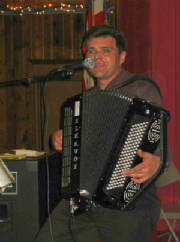 Gary has played for many years with various bands and has several successful recordings released. He has also played for a prominent Ukrainian folk dance company at many of the festivals and theaters throughout the country. One of his passions is the music. Luckily he has surrounded himself with outstanding talent with similar visions. He is the Director and an original member of the The Wave. A very professional recording well-done!